Speaking of New Orleans, Diana Hollingsworth Gessler has reissued Very New Orleans: A Celebration of History, Culture, and Cajun Country Charm, published by Algonquin Press. This new edition has updates on the Crescent City, since the original went to press around Hurricane Katrina. This is not your typical guidebook. Gessler is a professional artist and travel writer who tours the country penning tales of fascinating places while sketching what she sees; her articles and drawings are published regularly in Southern Lady magazine. 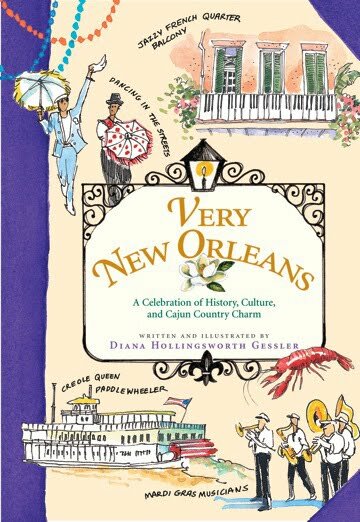 Very New Orleans is a petite book (perfect for slipping into a purse) that’s choke full of Gessler’s imaginative and informative drawings, from the street artists of the Vieux Carré to K-Paul’s Cajun martini. 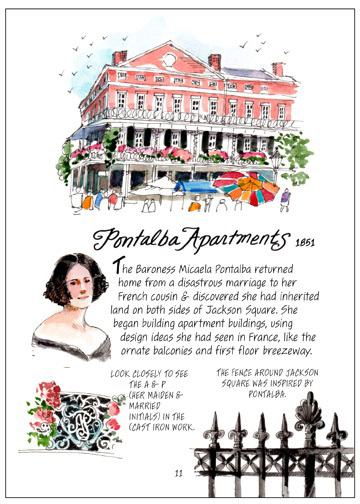 She fills pages with important places to visit but also the colorful expressions and unique traditions that locals enjoy, everything from the Live Oak Society and how trees get their names to how New Orleanians sell snowballs are not snow cones. Personally, anyone who includes Domilise’s for poboys gets high marks in my book! Very New Orleans makes a great gift, in addition to a handy travel guide. Gessler gets New Orleans and gets it right — and not too many people do.